Your new accessory, from the Middle East. Made in Iran, from Persian kilim. No ‘pleather’ red cheek embarrassment, with a real leather backpack. Some girls have a ‘gift’ for telling the difference between pleather and leather. But one thing’s for sure. You’ll be able to feel a real leather backpack. It changes the way you treat it, style it and match it with your outfit. See, when you have something of value, you want to care for it. And buying real leather, you’ll be looking after it because you want to show it off. That feeling, of pride, is what we have as we’re making your leather tote bag or backpack. Creating only one of each bag simply reiterates that uniqueness. Lotus vs. Etsy, Ebay, Amazon… and more great reasons to buy your leather handbags online from us. Unhappy once you see it? Use our returns policy. Define your style. Tell the world you’re unique! You’ve probably never been to Iran. That’s okay, not many people have. Instead, we want to bring one of its most visually stunning art forms to you: kilim. Walk into any home décor shop and you’ll see perfectly woven Persian rugs. 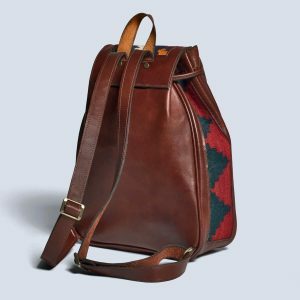 Well, instead of spending thousands on a rug or kilim, invest a fraction of that into a gorgeous kilim leather backpack. Being Australian based, we know what you want. We see the types of bags being worn, and more importantly, what’s not being worn. That handmade, genuine leather, vintage look is missing. And no other company does kilim leather products better than Lotus Handicraft. Order your new backpack or tote bag online today. If you’re in Adelaide, you can pick it up and meet the designer. If not, we’ll deliver it to you, wherever you are.